Heh. 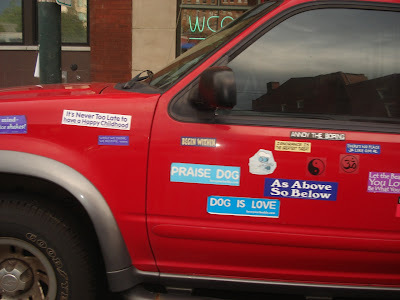 My friend's wife has a sticker on her car that reads 'Dog is My Co-Pilot'. 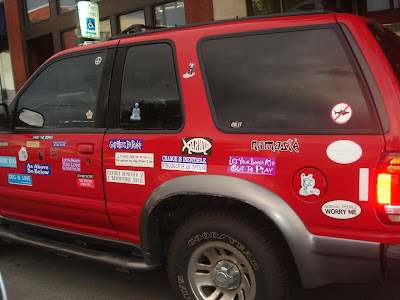 I think another sticker explains this car nicely: NORMAL PEOPLE WORRY ME. Ah, the charm of the modern left -- respecting all faiths except that of their immediate neighbors. That, they spit upon. Am I the only one who thinks that defacing a $30,000+ automobile with randomly placed, adhesive backed non-sequiturs is a sign of mental illness? Reminds me of a joke. Stop me if you've heard this one. Definition of dyslexic atheist: a person who doesn't believe in a dog. Wonder if this car had a handicapped sticker, seeing that it's parked in a blue spot. Anyway, I am sick and tired of the self-congratulatory tone of so-called enlightened people. I have been on the receiving end of that brand of hypocracy. It wasn't pleasant to go through, but I am thankful for it. It made me grow out of that awkward 'liberal' stage. Evidently, the driver of that car has not. The denizens of "The Worker's Paradise" of the former Soviet Union often displayed an insightful and biting sense of ironic humor at their self-exalted leaders, their own plight as part of the "noble" Worker class, and their general Communist-Socialist Utopian cultural context. With a wry smile they said something that went roughly, "I hope to God that there is no God."